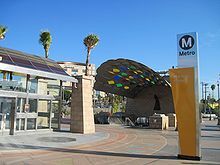 Boyle Heights is a neighborhood of almost 100,000 residents east of Downtown Los Angeles in the City of Los Angeles, California. The district has more than 20 public schools and 10 private schools. Boyle Heights was called Paredón Blanco ("White Bluff") when Alta California was part of the First Mexican Republic. The area is named after Andrew Boyle, an Irishman who purchased 22 acres (8.9 ha) on the bluffs overlooking the Los Angeles River after fighting in the Mexican–American War. From 1889 through 1909 the city was divided into nine wards. In 1899 a motion was introduced at the Ninth Ward Development Association to use the name Boyle Heights to apply to all the highlands of the Ninth Ward, including Brooklyn Heights, Euclid Heights, and the aforementioned Boyle Heights. In 2017, some residents were protesting gentrification of their neighborhood by the influx of new businesses, a theme found in the TV series Vida, set in the neighborhood. In the 1950s, Boyle Heights was racially and ethnically diverse, with Jews, Latinos (mainly Chicanos), various sectarian Spiritual Christians from Russia, Yugoslav (Serbian and Croatian) immigrants, Portuguese people, and Japanese Americans living in the neighborhood. Bruce Phillips, a sociologist who tracked Jewish communities across the United States, said that Jewish families left Boyle Heights not because of racism, but instead because of banks redlining the neighborhood (denying home loans) and the construction of several freeways through the community, which led to the loss of many houses. As of the 2000 census, there were 92,785 people in the neighborhood, which was considered "not especially diverse" ethnically, with the racial composition of the neighborhood at 94.0% Latino, 2.3% Asian, 2.0% White (non-Hispanic), 0.9% African American, and 0.8% other races. The median household income was $33,235, low in comparison to the rest of the city. The neighborhood's population was also one of the youngest in the city, with a median age of just 25. As of 2011, 95% of the community was Hispanic and Latino. The community had Mexican Americans, Mexican immigrants, and Central American ethnic residents. Hector Tobar of the Los Angeles Times said, "The diversity that exists in Boyle Heights today is exclusively Latino". The Los Angeles County Department of Health Services operates the Central Health Center in Downtown Los Angeles, serving Boyle Heights. The United States Postal Service's Boyle Heights Post Office is located at 2016 East 1st Street. The emergence of Latino politics in Boyle Heights influenced the diversity in the community. First and foremost, Boyle Heights was a predominantly Jewish community with "a vibrant, pre-World War II, Yiddish-speaking community, replete with small shops along Brooklyn Avenue, union halls, synagogues and hyperactive politics ... shaped by the enduring influence of the Socialist and Communist parties" (Burt, 22) before Boyle Heights became predominantly associated with Mexicans/Mexican Americans. The rise of the socialist and communist parties increased the people’s involvement in politics in the community because the "liberal-left exercised great influence in the immigrant community" (Burt, 22–23). Even with an ever-growing diversity in Boyle Heights, "Jews remained culturally and politically dominant after World War II"(Burt, 23). However, as the Jewish community was moving westward into new homes, the largest growing group, Latinos, were moving into Boyle Heights because to them this neighborhood was represented as upward mobility. With Jews and Latinos both in Boyle Heights, these men part of the Jewish Community Relations Council (JCRC); Louis Levy, Ben Solnit, Pinkhas Karl, Harry Sheer, and Julius Levitt helped to empower the Latinos who either lived among the Jewish people or who worked together in the factories. The combination of Jewish people and Latinos in Boyle Heights symbolized a tight unity between the two communities. The two races helped each other in order to elect Edward R. Roybal into city council against his opponent Councilman Christensen; with the help from the Community Service Organization (CSO). In order for Roybal to win a landslide victory over Christensen, "the JCRC, with representation from business and labor leaders, associated with both Jewish left traditions, had become the prime financial benefactor to CSO .. labor historically backed incumbents ... [and] the Cold War struggle for the hearts and minds of minority workers also influenced the larger political dynamic"(Burt, 26). In the 1947 election, Roybal lost and then Saul Alinsky; well-known Chicago-Jewish community activist and his company, the Industrial Areas Foundation (IAF) garnered support from the Mexican Americans in order for Roybal to win the 1949 election(Bernstein, 243). When Edward Roybal had just started as the city of Los Angeles' new city councilman in 1949, he experienced racism when trying to buy a home for his family. The real estate agent told him that he could not sell to Mexicans, and from then on Roybal's first act as councilman was to protest racial discrimination and to create a community that represented inter-racial politics in Boyle Heights. The Community Service Organization (CSO) helped Roybal win the election and to increase the multi-racial involvement in Boyle Heights(Bernstein, 224). Therefore, Roybal’s involvement in City Council affected how Latino politics went further on during Bradley's term and for future political leaders coming from Boyle Heights. This Latino-Jewish relationship shaped politics because when Antonio Villaraigosa became mayor of Los Angeles in 2005, and "not only did he have ties to Boyle Heights, but he was elected by replicating the labor-based, multicultural coalition that Congressman Edward Roybal assembled in 1949 to become Los Angeles's first city council member of Latino heritage"(Burt, 23). Furthermore, the Vladeck Center (named after Borukh Charney Vladeck) contributed to the community of Boyle Heights in a big way because it was not just a building, it was "a venue for a wide range of activities that promoted Jewish culture and politics"(Burt, 22). This center will be forever known as the building place where coalition politics took place in Boyle Heights, along with the Catholic Dolores Mission center. Just 5% of Boyle Heights residents aged 25 and older had earned a four-year degree by 2000, a low percentage for the city and the county. The percentage of residents in that age range who had not earned a high school diploma was high for the county. Hollenbeck Home for the Aged, 573 S Boyle Ave. Built in 1918, photo taken 1956. Breed Street Shul, which was declared a historic-cultural monument in 1988. Self-Help Graphics and Art, the first community-based organization in the country to create a free public celebration of Day of the Dead. Sears Building, Olympic Boulevard and Soto St.
Lucha Underground Temple, where the television program Lucha Underground is taped. Sisters Orphan Home, operated by Daughters of Charity of Saint Vincent de Paul, 917 S. Boyle Ave. demolished due to earthquake damage and construction of freeway. 1987: Born in East L.A.
^ a b c "Los Angeles Times Neighborhood Project". The Los Angeles Times. Retrieved 2010-04-11. ^ George J. Sanchez (2004). "What's Good for Boyle Heights is Good for the Jews: Creating Multiculturalism on the Eastside during the 1950s". American Quarterly. 56 (3): 663–661. ^ Vigeland, Tess (March 14, 2013). "Neighborhoods: Exploring the rich history and culture of Boyle Heights". Take Two. KPCC. Retrieved 1 November 2017. ^ "What's in a Name? Ninth Ward Citizens Vote in Favor of Boyle Heights". Los Angeles Herald. 24 May 1899. ^ Ruben Vives (July 18, 2017). "A community in flux: Will Boyle Heights be ruined by one coffee shop?". Los Angeles Times. Retrieved October 11, 2017. ^ a b Tobar, Hector. "A look back at the Boyle Heights melting pot." Los Angeles Times. December 9, 2011. Retrieved on December 10, 2011. ^ "Central Health Center." Los Angeles County Department of Health Services. Retrieved on March 18, 2010. 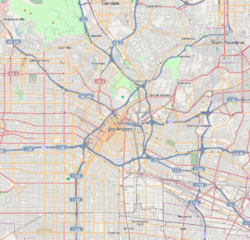 ^ "Post Office Location - BOYLE HEIGHTS." United States Postal Service. Retrieved on December 7, 2008. ^ The City Project. "Historic - Cultural Monuments (HCM) Listing" (PDF). Retrieved 9 September 2012. ^ Suarez, Lucia. "Mexican Lucha Libre gets American face time in new El Rey Network drama series". Fox News. Retrieved 4 February 2015. ^ a b Queally, James (April 22, 2015). "Learn to speak lucha: The secret language of the squared circle". Los Angeles Times. ^ Los Angeles Public Library reference file This file was compiled in 1937 by Works Progress Administration worker Clare Wallace from an interview with Dorsey on June 23 of that year and from newspaper articles. ^ Now part of North Cummings Street. Archived 2013-05-08 at the Wayback Machine Location of the Oscar Macy home here on Mapping L.A.
^ Rebecca Spence (2008-02-20). "L.A.'s Latino Mayor Welcomed as One of the Tribe". The Jewish Daily Forward. Retrieved 2009-06-03. ^ David Kamp "Live at the Whisky"
^ "LifeChums: Be Chums 4 Life"
^ Loza, Steven (1993). Barrio Rhythm: Mexican American Music in Los Angeles. University of Illinois Press. p. 148. ^ Taboo; Steve Dennis (February 8, 2011). Fallin' Up: My Story. Touchstone. pp. 1, 3–4. ISBN 1-4391-9206-5. ^ Will.i.am on Living in East Los Angeles | Exclusive Interview | NELA TV (Web video). Los Angeles, CA: egentertainment.net. 2011-02-17. ^ a b "Hollywood Depicts Latinos Solely In Stereotypes". The Huffington Post. Retrieved 2016-01-08. 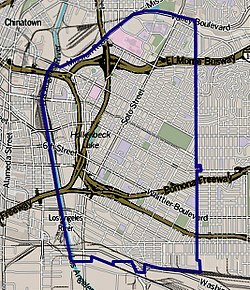 Wikimedia Commons has media related to Boyle Heights, Los Angeles, California. This page was last edited on 18 March 2019, at 10:02 (UTC).